The artwork “This big land” has been completed this week, and I’m pleased with the final result. It was an evolving work comprising many layers, and I continued with it for more than a month till I was satisfied the painting was resolved. The inspiration for its’ creation is a combination of experience and memory of various diverse Australian landscapes: Central Australian desert, rural drought, pink mists and sunsets. These things coalesce into a work which is about the spirit of the land, and its’ vast ancient presence beyond the narrow coastal strip. A great beauty is found in that expansive harshness, both unsettling yet alluring at the same time. The land speaks of a timeless presence stretching back to ancient roots and beginnings, and I’m grateful for being part of this powerful place. This artwork is acrylic paint on stretched canvas. Please enjoy “This big land”. Finished another painting yesterday…a very tiny one. I’ve called it “Profusion”, as an expression of the abundant growth here on the mountain. There’s a lot of movement in this work, and this also expresses the energy of growth. The red/orange background colour is very similar to the colour of the earth in my garden. Greens and yellows echo the local plant life which has a grand lushness to it. I’ve been working on this piece for a couple of weeks, and now it’s complete. The painting is titled “At home on the hillside” and is part of my Remembrance series. For me, it evokes memories of living in sub tropical Northern NSW….of seeing homes and sheds from a distance, on hillsides, as this is quite an elevated place. Large green areas, both dark (rainforest) and lighter (grass) are punctuated by small bright hues which could represent buildings, tracks, farmed patches and dams. Paint has been applied in many layers, yet leaving some underlying areas showing. My personal memory is of vibrant sunny colours and much happiness. There’s a lot of freedom in the brushstrokes and this reflects the personal freedom I felt living there….much loved and enjoyed. Hope you enjoy the artwork too. 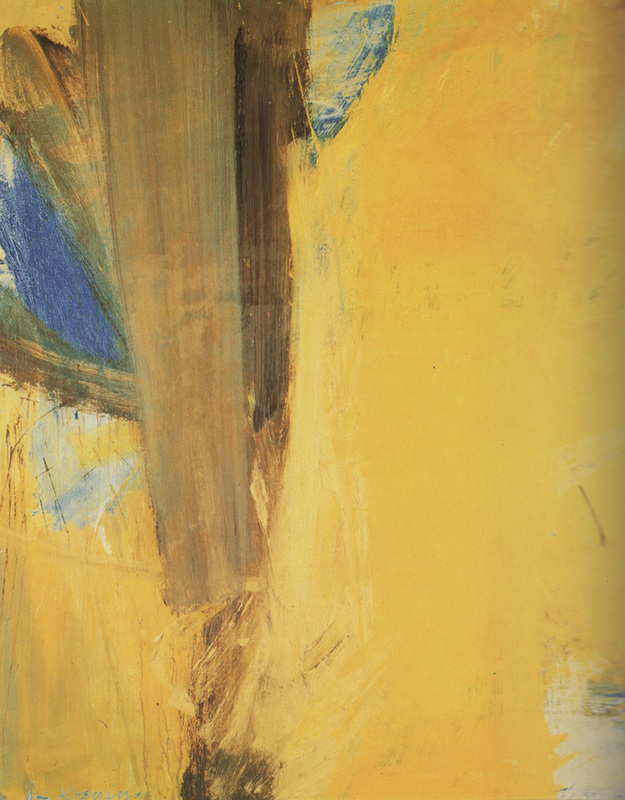 I’ve chosen this 1958 painting, “Montauk Highway”, by the great abstract expressionist artist Willem de Kooning as artwork of the month. My memory of it has inspired my abstract painting all my adult life. It’s such a powerful statement and has rich vibrant colour, something that many of de Koonings works possessed. He had an interest in billboards, highways, and images of the “American dream”, and this one is a highway reference. To me, I can just imagine rushing down that highway at great speed when I view this picture. It has an exuberance and energy that dives into life. This month, after a time of family ill health, I’m bringing back Artwork of the month. This November it’s a painting that’s hanging on my wall, which I made 14 years ago, and still remains a favourite. The title is “Rainforest stream, Terania”, and it realistically depicts a beautiful rainforest creek in Northern New South Wales, Australia. I lived in the area for many years and visited this rainforest many times, often taking photos. This part of the creek is in the Nightcap National Park, and is one of my most beloved places. The water is pristine, and the creek itself is ever changing in subtle ways. I made a series of artworks at this time, in a very realistic vein. The series was called “Spirit of Place” and depicted places I’d personally visited that had lasting impacts on my life. “Rainforest Stream, Terania” has vibrant colours, and this is actually how Terania Creek looks in midday sunlight. The painting took 6 months to complete, with my returning to it till I was satisfied with the final piece. Hope you enjoy!